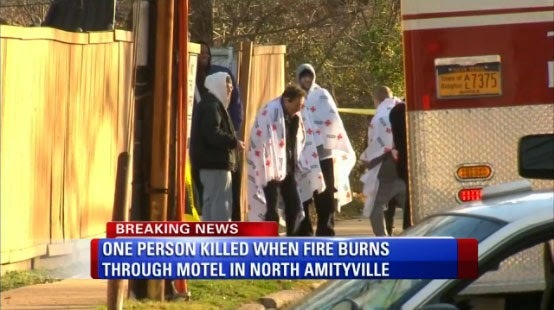 Residents of North Amityville motel provided with Red Cross blankets and services after they evacuated from a fire. Over the last 7 days, the Greater New York Red Cross provided emergency assistance to 119 adults and 34 children following 61 local disasters. Following a fatal fire at a motel in North Amityville (Suffolk County) last Saturday, the Red Cross was able to provide residents with food, financial assistance, emergency shelter and emotional support. Saturday, Astoria (Queens) residents awoke to flooded basements after a water mainbreak. Red Cross volunteers spent the day on scene providing emergency assistance to displaced families and distributing more than 40 flood clean-up kits. Early Friday morning, a 4-Alarm fire broke out in a East New York (Brooklyn) apartment building. Residents left homeless by the blaze turned to the Red Cross for emergency assistance. Through out the week, Red Cross Disaster Logistics teams continued to transfer supplies to newly purchased trailers that are pre-positioned in the event of large-scale disasters like Superstorm Sandy. Metro New York North Red Cross responded to a rash of fires, providing emergency assistance to families in Middletown, New City, Salisbury Mills and Haverstraw. Tonight, the Red Cross will partner with the NY Islanders in support of our mission. You can still purchase discounted tickets to the final Red Cross Charity Night at Nassau Coliseum. Blood Drive on December 20th from 9am to 3pm at the Nassau Coliseum where all presenting donors will receive a voucher for two tickets to an Islanders home game during the 2014-15 regular season and a chance to win autographed Islanders memorabilia and more! Walk-ins are welcome, or to schedule an appointment to donate call 1-800-RED CROSS or visit redcrossblood.org. Reference sponsor code ISLANDERS. This Friday, Youth Services/Red Cross Clubs will be holding their annual fundraising movie night. This year’s screening will be the holiday classic “The Santa Clause” starring Tim Allen. Showtime starts at 5pm at the GNY Chapter 520 W 49th Street. Popcorn and drinks will be sold. RSVP via email at Amanda.crabbe@redcross.org.